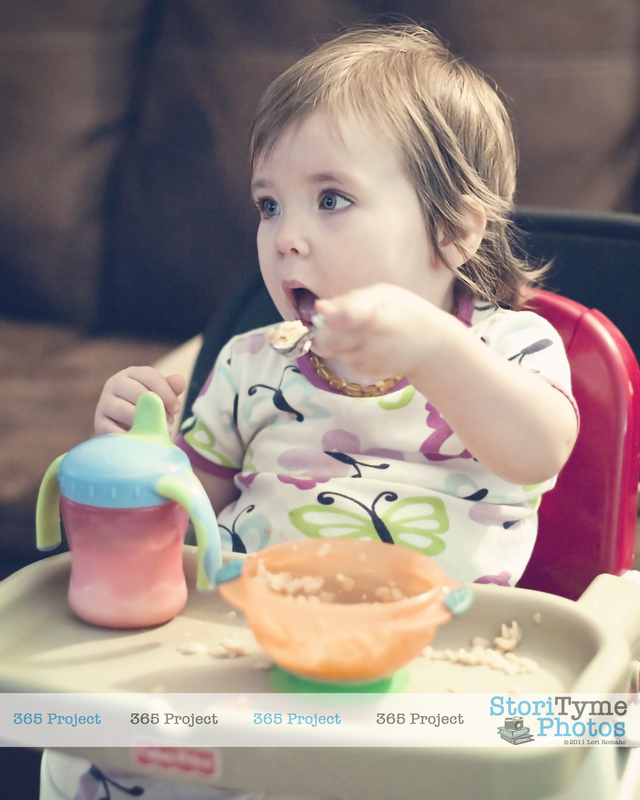 365 Project – Day 201 – Dining Etiquette…with a Toddler? In general, I fancy myself a pretty tolerant and easygoing person, but there are few things that get under my skin faster than people chewing loudly with their mouths open and smacking their food. In fact, sitting down to eat dinner with someone whose chewing habits are downright bovine in nature makes me borderline homicidal. And the fact that the table is set with an array of sharp instruments certainly doesn’t help. So, I do what anyone would do when faced with a frighteningly uncomfortable dining situation, I order a drink and pray that the alcohol will dull my sense of hearing first, followed closely by my eyesight, so that I don’t actually have to see the half-masticated food rolling around in my dinner partners’ mouths. Don’t get me wrong, I don’t have perfect dining etitquette myself. I always forget where to place my napkin when need to excuse myself from the table in the middle of a meal, and I certainly get so caught up in mealtime conversations that I begin to speak before I’ve had the chance to finish the bite that’s in my mouth. But, I take great pride in chewing with my mouth closed and being 100% Smack Free. Catch me smacking my food during a meal and I give you full permission to smack me in the forehead with your soup spoon. Now that I’m a mother, it is my responsiblity to teach my daughter the rules of etiquette. I don’t know that I will ever sit her down with a table setting chart and require her to memorize it, but I will make sure that she learns to sit nicely, speak politely, ask that things be passed to her, say please and thank you, use her utensils like a civilized human being and, for the love of all that is good and holy, chew her food with her mouth closed and refrain from smacking. So far, Cadence is doing as well as you might expect any 18-month-old child to do. Unless she is severely overtired, she will sit patiently through a meal without throwing any crazy tantrums, and she will eat darn near anything you put in front of her without protest. For the most part, she eats daintily and chews quietly, though every now and then she thinks it’s funny to see just how much cheese or how many fruit snacks she can shove in her cheeks, and then gives everyone in the room a big toothy grin before opening her mouth wide to show off her big accomplishment. Eh, you pick your battles, right? At this point, Cadence has pretty much mastered using a fork, but is still perfecting how to use a spoon. She just doesn’t quite understand how to get the food from the plate to her mouth on the spoon without tipping it and losing most of it along the way. We’re getting there though. 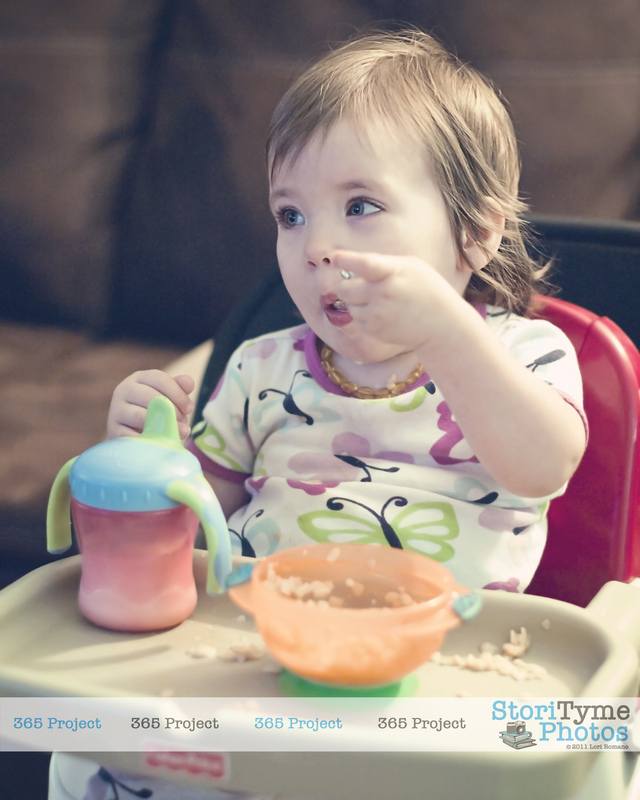 Today, she practiced with a bowl of Rice Krispies and milk. Save for a shirt soaked with milk and some stray Rice Krispies that ended up in her hair, she did pretty darn well! Today’s 365 Project entry is dedicated to my mild-mannered girl, and doing everything I can to make sure she stays that way.